Michigan has a long tradition of labor unionism, and union members can look back with pride on their accomplishments. Organized labor dominates the automobile industry, still the state's largest. 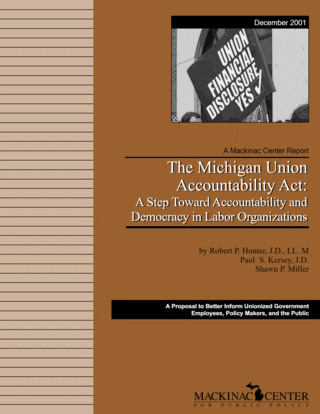 The tradition that started with Walter Reuther and Jimmy Hoffa continues to the present day, with Michigan having one of the highest rates of union representation in America's workforce; 938,300 workers constituting 20.8 percent of Michigan's workforce are represented by labor unions. This includes 321,500 public sector employees. How much do these employees pay in dues to their unions, and does it amount to a sum large enough to warrant mandatory financial disclosure? Unionized employees pay a considerable price for the representation they gain. For example, full-time public school support personnel represented by the Michigan Education Association (MEA) pay annual dues of $290.20, while teachers themselves pay $580.40. The MEA took in $46 million in membership dues in 1999. Full-time Michigan employees represented by Council 25 of the American Federation of State, County, and Municipal Employees (AFSCME) pay $294.60 annually. Other unions, such as the United Auto Workers (UAW) and the Teamsters use a sliding scale in which annual dues are set at a percentage (around 1.1 percent) of a worker's base salary. The use of sliding scales and discounts for part-time workers makes it difficult to calculate the average dues paid by union workers. But the results of a recent lawsuit against the California State Employees Association (CSEA) provides a benchmark. Earlier this year the U.S. District Court ruled that the CSEA was obligated to refund 20 percent of fees it had taken from non-members across the state. According to the National Right to Work Legal Defense Foundation, which provided legal assistance to the workers, CSEA had been collecting $1.1 million monthly from 37,000 state employees in eight statewide bargaining units. This works out to $13.2 million in annual dues revenue from the affected bargaining units, or $356 per worker. Under federal law, once a union wins a certification election and is officially recognized it becomes the representative for all employees in the work unit, including those who opposed unionization. With that privilege also comes the option to bargain for a union security clause, which requires all employees covered by the contract to either join the union or pay what are typically referred to as "fair share fees" or "agency fees." The State of Michigan has similar provisions, covering state and local government employees. Some states, most recently Oklahoma, have passed "right to work" laws, which bar agency shop clauses so that workers are not required to join a union or pay agency fees in order to work. The fact that Michigan is not a "right to work" state leaves workers in Michigan vulnerable to a wide range of potential abuses. The idea that workers should pay their "fair share" for union representation assumes that all workers benefit. Whether or not this is actually true depends upon the quality of representation, both in terms of expertise and ethics, and may also be affected by the details of a contract. Union contracts assure uniform treatment of all workers but not all workers have the same priorities, so that even the most diligent of unions may wind up hurting the interests of some employees. Setting aside First Amendment freedom of speech and association objections to the practice of charging agency fees to non-members, the fact remains that workers are in a much better position than lawmakers to decide whether the union is doing its job well enough to deserve their support. The Supreme Court placed some limits on the collection and use of fees from non-members beginning in 1961 with Machinists v. Street. The original Street case limited only that portion of non-member fees devoted to political activity by unions representing workers in the railroad and airline industries. But the doctrine was expanded to include public sector workers in Abood v. Detroit Board of Education, then refined until the case of Ellis v. Railway Clerks, in which the Supreme Court ruled that non-members could be charged only for expenditures "incurred for the purpose of performing the duties of an exclusive bargaining representative." The principle that workers should not be charged for non-representational activity made a large leap forward in 1988 with Communications Workers v. Beck. The Supreme Court, concluding that the union shop provisions of the Railway Labor Act and the National Labor Relations Act (NLRA) were passed for similar reasons, extended the rules laid out in Street, Abood, and Ellis to workers subject to the NLRA. All workers in a unionized workplace now have the right to resign from the union and pay only for negotiation, contract administration, and the handling of grievances. These generally are referred to as Beck rights. The fact that the U.S. Supreme Court has to intervene to establish American workers' right not to be a member of an organization should tell us something is wrong. But even with such intervention, under both federal and state law workers at a unionized facility still are required to make some sort of payment, whether they support the union or not. Not surprisingly, union officials are determined to keep "fair share" fees as high as possible. And they strenuously resist attempts to open their records to scrutiny so it can be accurately determined how much the union spends on representing workers and how much it spends on other activities. Enforcing Beck rights, or even letting workers know they exist, has been a slow, difficult process. Most union workers have no idea they have the right to question or even to withdraw consent for their dues being used for other than representational purposes. Union officials would like to keep it that way. The National Labor Relations Board was slow to release rules enforcing Beck, waiting seven years, until 1995, before releasing a decision on a Beck case. The rules it eventually promulgated were useful but did not go as far as the courts have in similar public-sector cases. The first Bush administration waited until 1992, four years after Beck was decided, before taking action. It issued Executive Order 12800, which required the display of a poster describing Beck rights at the worksites of federal contractors. Despite the fact that the order covered only a limited number of worksites, the Clinton administration rescinded it within a month of that president's inauguration, on the ground that the posters did not inform workers of any of their other rights under the NLRA. George W. Bush reinstated the original Beck rights display requirement in February 2001. Beck was a victory for workers, but the fruits of that victory have largely been denied due to political infighting and the refusal of union officials to notify workers of their rights or generally cooperate with those workers who oppose their political agenda. Union Membership and Earnings Data Book, The Bureau of National Affairs. IRS form 990 submitted by the Michigan Education Association 12/2/00. Per telephone conversation with an employee of AFSCME DC 25, Sept. 20, 2001. AFSCME dues are lower for part-time workers, but the bottom rate is a still substantial $18.75 per month. Mackinac Center researchers also contacted the Michigan Federation of Teachers, the Fraternal Order of Police and the Police Officers Association of Michigan. At the time this was written these organizations had yet to respond to our inquiries. For example, consider a college student working nights at a grocery store, who needs to leave work at a reasonable hour to complete assignments and get some sleep before classes start in the morning. If the contract leaves overtime to management's discretion, this worker's studies might suffer. The existence of a written contract expressly giving management the power to assign overtime hampers any arrangement this worker might make that would allow him to leave earlier than his co-workers. Naturally, whether the extra pay is worth the damage to his academic career would depend on how much value he puts on his education. Abood v. Detroit Board of Education, 431 U.S. 209 (1977); Ellis v. Railway Clerks, 466 U.S. 435 (1984). California Saw and Knife Works, 320 NLRB 224 (1995). Executive Order 12836, 58 Fed Reg. 7045 (1993). It would have been no great difficulty to amend the rule to include any other rights the Clinton administration felt were pertinent. Executive Order 13201, 66 Fed Reg. 11219 (2001).